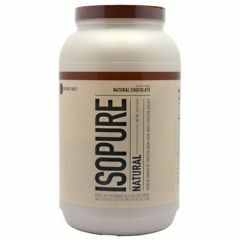 AllegroMedical.com presents The Nature's Best Isopure Natural - Chocolate Protein Supplement. 50 grams protein per serving. 100 % whey protein isolate. 10,900 mg BCAA's per serving. Lactose free. 4.6g l-glutamine per serving. Instanized. Nature knows best. Sweetened only with cane sugar & Luo Han Guo, Natural Isopure packs 50 grams of 100% whey protein isolate with a taste that will make you hug trees. All-natural vitamins and minerals, and no fat, lactose, gluten or impurities. Sweet. Ion Exchange Whey (milk) Protein Isolate, Microfiltered Whey (milk) Protein Isolate , Evaporated Cane Juice Crystals, Cocoa powder, Potassium Chloride, Natural Flavors, Dicalcium Phosphate, Calcium citrate, Magnesium Oxide, acerola, Luo Gab Guo, citric acid, alfalfa concentrate, garlic powder enriched with selenium, sodium chloride, zinc sulphate monohydrate, dried help power, inositol, D alpha tocopherol Succinate, beta carotene, d-calcium pantothenate, menaquinone (Vitamin K), copper oxide, pyridoxine, riboflavin, thiamine hydrochloride, cyanocobalamine, soy lecithin.